Now everyone has their images and text myself and Helen could finally start work on the catalogue. The class have spoken before about having a digital one, eliminating printing costs and meaning people from all over the wold can access it. We have been looking at existing catalogues, including National portrait Gallery, and past Coventry University ones. Here are a few of the ones we looked at. The main different is that these are print, but we were looking more for stylising ideas, seeing what works well and what doesn’t. We weren’t keen on the past University one (top left and top right), the profile photos enforce the idea of a educational show even more, which is something the group don;t want to focus on. Yes we are a degree exhibition but this is also us as a group of photographers rather than a group of students. Also the small images seem pointless to me, the photos need to be more dominant than the text. 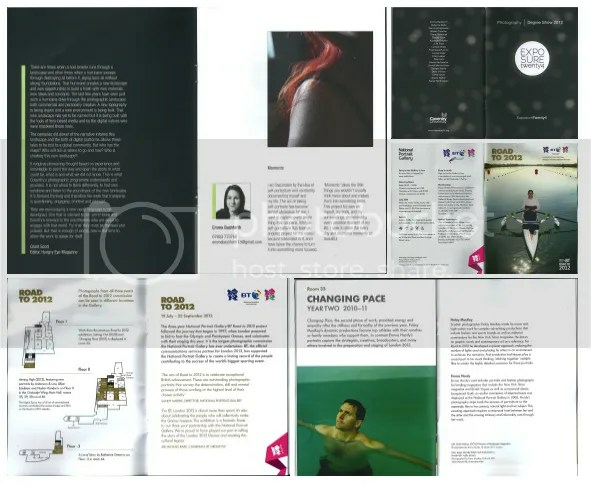 Moving onto the NPG olympic special catalogue, (bottom left/right and middle right). The full image cover with little text is professional and eye catching, also the double page per photographer and simplicity of the pages is something we loved. We feel their map page is a bit complicated and we want to make ours simpler with interactive areas and acting as a contents page. – A slow changing front cover, so everyones work is on it. – An interactive map of the exhibition as a contents page. – A live twitter feed for feedback. We stuck to the branding we already have, added the necessary details and kept it simple, taking styling influence from the NPG’s catalogue. Here is our first draft, still missing information and images from people who haven’t sent us theirs yet. Once the first page was done it didn’t take long to slot everyones information into place. Now people can see what info we need and why I hope they will be fast at sending it over.